Economic Issues is a peer reviewed academic journal published twice a year in March and September. Further details about the journal can be found by clicking on the tabs above or on the menu to the left. The back catalogue of Economic Issues can be accessed simply by clicking on the relevant volume using the Index to Past Issues menu. From here readers can access abstracts of all major articles, and free full text pdfs (restricted access on newer articles as per our Open Access Policy Statement). September 2018: Full text pdf access added for part 2 of Volume 23 (2018) including book reviews. March 2018: Full text pdf access added for part 1 of Volume 23 (2018) including book reviews. September 2017: Full text pdf access added for part 2 of Volume 22 (2017) including book reviews. March 2017: Full text pdf access added for part 1 of Volume 22 (2017). December 2016: new Open Access Policy Statement for Economic Issues implemented. September 2016: Full text pdf access added for part 2 of Volume 21 (2016). April 2016: Call for Special Issue of Economic Issues accompanying ESRC Seminar Series on Factor Income Distribution, Work and Employment. See https://factorincomedistribution.wordpress.com/ for details. March 2016: Full text pdf access added for part 1 of Volume 21 (2016). September 2015: Full text pdf access added for part 2 of Volume 20 (2015). March 2015: Full text pdf access added for part 1 of Volume 20 (2015). September 2014: Full text pdf access added for part 2 of Volume 19 (2014). March 2014: Full text pdf access added for part 1 of Volume 19 (2014). Book reviews are now included in full text pdf. September 2013: Full text pdf access added for part 1 and part 2 of Volume 18 (2013). March 2013: Full text pdf access added for part 1 and part 2 of Volume 17 (2012). 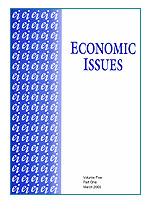 September 2012: Articles from Economic Issues are now listed on RePEc. August 2012: Full text pdf access added for part 1 and part 2 of Volume 16 (2011). April 2012: (1) You can now follow Economic Issues on Twitter; (2) Blog updated with contents of recent editions of Economic Issues. January 2012: Update expanding free full text pdf access to entire back catalogue of past issues (excluding most recent year). December 2011: Update including link to new Economic Issues Blog (link opens separate website). November 2011: Site re-launched including free access to full text pdfs of past issues from 2004 onwards. Economic Issues is a registered charity.